LUEBECK, GERMANY.- A winter dream from glittering ice will enchant Lübeck until January 23rd 2005. 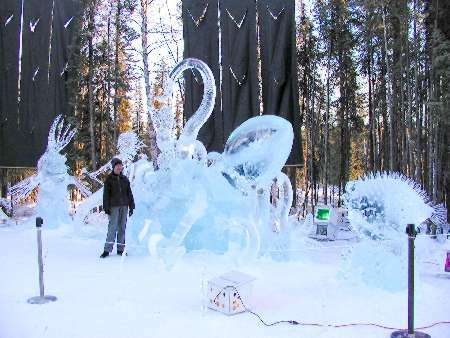 The 2nd International Festival of Ice Sculptures Ice World is dedicated to a Fantasy in Ice. Both the Festival of Ice Sculptures and the ice-skating rink in front of the famous Holstentor will turn the place into a magical winter scenery amidst the medieval brick stone architecture. A special highlight of this years Ice World: the World Championship of Ice Carvers will take place in Lübeck from December 7th until 9th 2004. In 2004 the ICEART World Championship team competition will take place in Germany for the first time and only for the third time in Europe since it was started more than 20 years ago. The official title of the event is ICEART World Championship 2004. The World Championship is ruled by the regulations of the National Ice Carving Association (NICA) and will take place before the official opening of Ice World for the public. The organiser of the World Championship and the artistic director of Ice World is Mr. Gert J. Hödl, Ice Artist and threefold Champion from Austria. The results of the championship will be presented to the public during Ice World from December 10th on. Teams from 15 nations consisting of two ice carvers each will compete in Lübeck. Participants are teams from Armenia, Australia, China, Germany, France, Italy, Japan, Canada, Croata, the Netherlands, Austria, Russia, Sweden, the Czech Republic and the US. Each team creates one ice sculpture, which represents the respective home country, and a second sculpture for the competition which will be dedicated to a motto to be chosen by the artists. The participants must create and finish their master piece with a minimum height of 3 metres from 16 ice blocks (25x50x100cm) within a fixed period of time of only 30 hours. The drafts of the sculptors go from the fabulous Balancing Dragon from Australia and Hercules and the Hydra from Sweden to The ride to Lübeck with a mermaid and dolphins from Austria to Motocross from Canada and the bizarre Medival Jet from the Czech Republic. With the help of chain saws, drills, cutters and special ice carving tools from Japan and even fire impressive works of ice emerge from the ice blocks. Tajana Raukar from Croatia and her team partner Steve Price won the title in Bokrijk/Belgien in 2003. The jury consists of five world renowned ice carvers, representatives of NICA and also representatives from the Hanseatic city of Lübeck. The official prize giving ceremony will take place on December 9th directly in front of the Holstentor. Afterwards all visitors of the festival in Lübeck have the chance to vote for the most beautiful work of art. The most popular ice sculpture or rather the team will be awarded with the public prize. With this years Ice World in Lübeck we will set new standards of ice carving and the presentation of ice sculptures, comments Lübecks Director of Tourism Johann W. Wagner on the attractiveness of Ice World in the Hanseatic city of Lübeck for tourists, Nowhere in the world ice sculptures of this outstanding quality, made from 400 kg of ice are presented indoor. Last year nearly 250 000 visitors came to see the premiere of Ice World. Tip: When visiting ICE World do not forget to bring warm clothes. The unique ice bar inside the tent will offer cool drinks and cocktails. And after your visit to the amazing world of ice sculptures the cosy winter cafeteria awaits you inside the Holstentorhalle. For children ICE WORLD offers a particular amusement: An ice-slide on the winter playground in the thermal tent guarantees a cold enjoyment for the kids. And in the kids corner in the cosy and warm, tangerine-scented Holstentorhalle the little ice-friends can warm up again quickly. Equipped with playthings and toys the kids corner is real fun to visit. Or would you like to leave your tracks in the ice after having enjoyed so much masterly ice art? Then you are welcome on the ice-skating rink in front of the historic Holstentor. The large ice-skating rink with a surface of approximately 700 square metres offers fun on ice, while a separate ice-skating rink for children guarantees a cheerful slide for the small ice-skaters.